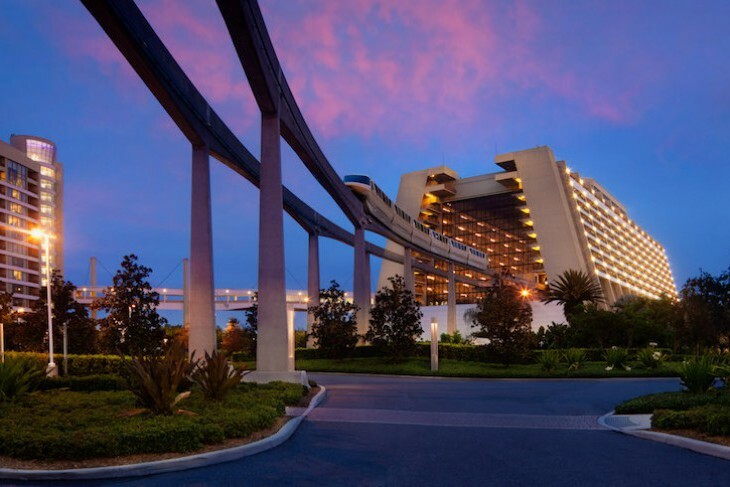 The fifteen-story, A-frame Disney's Contemporary Resort has long been a familiar landmark. What used to be considered a modern façade is now pretty darn austere with its soaring, open interior and its sharp edges and angles. Love it or hate it, its accessibility to the Magic Kingdom® Park can’t be beat. Of course, the sight of the monorail silently gliding through its core is simply magical. 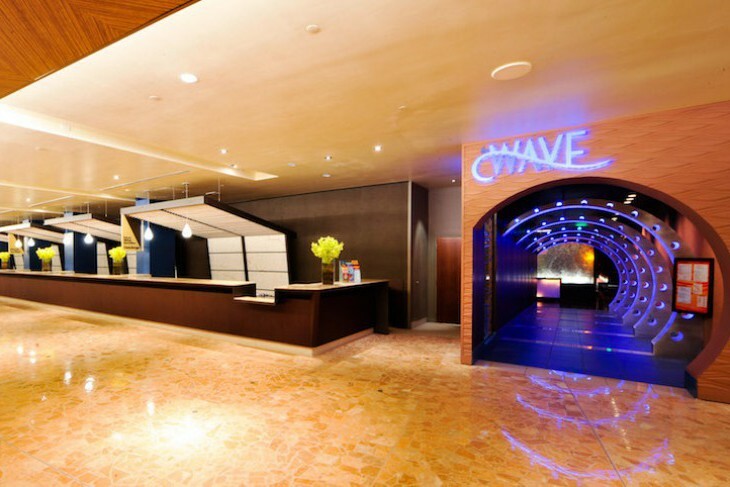 The property consists of a high-rise tower, a three-story wing, and a next-door convention center, making it a favorite choice for groups. 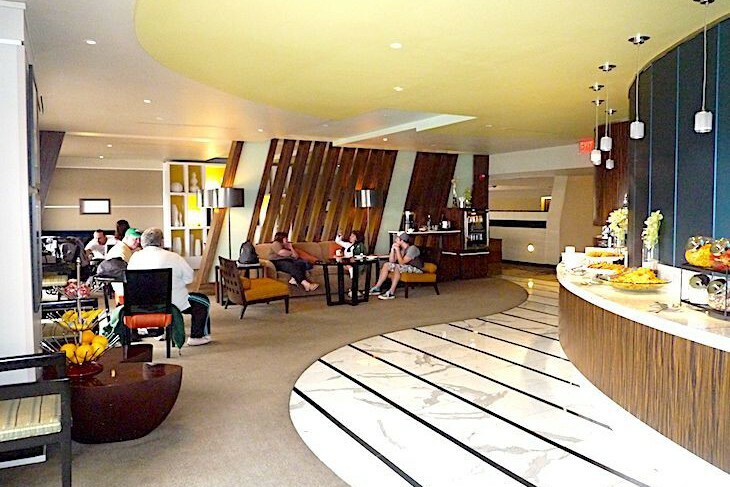 A marble lobby with chocolate colored, chenille sofas, and woven grass chairs always seems to be bustling. To feel the grandeur of the resort you’ll want to head to its centerpiece, the fourth-floor Grand Canyon Concourse whose soaring space boasts floors of guest rooms surrounding the vast atrium. At its heart stands a charming 90-foot mosaic mural of Native American children surrounded by shops, restaurants, and the monorail station, all constantly buzzing with traffic. High above it all sits the fifteenth-floor California Grill, one of Disney’s best restaurants, with a bird’s-eye view of the Magic Kingdom. 655 rooms. 4600 North World Drive, Lake Buena Vista, FL 32830; 407-824-1000; Fax 407-824-3539. 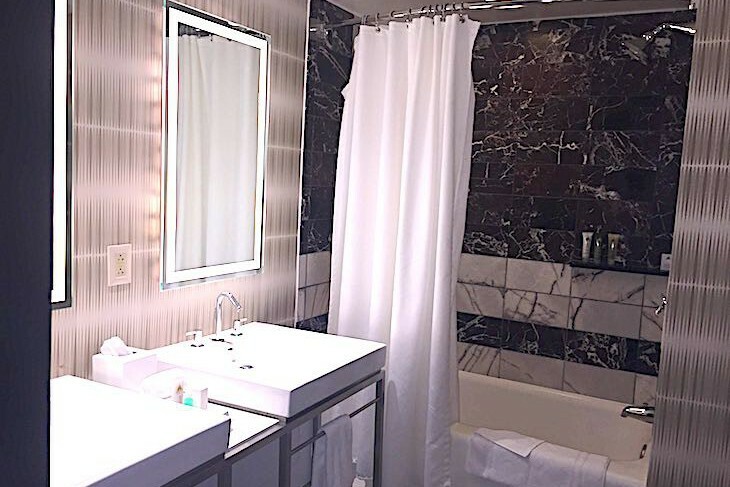 Check-in 3 p.m.; Check-out 11 a.m.
Lovely chocolate and cream marble bath, but the sinks are a bit impractical. There's even a balcony with a Magic Kingdom view. Guest room hallways overlook the 4th-floor concourse. Beach volleyball and swinging hammocks. 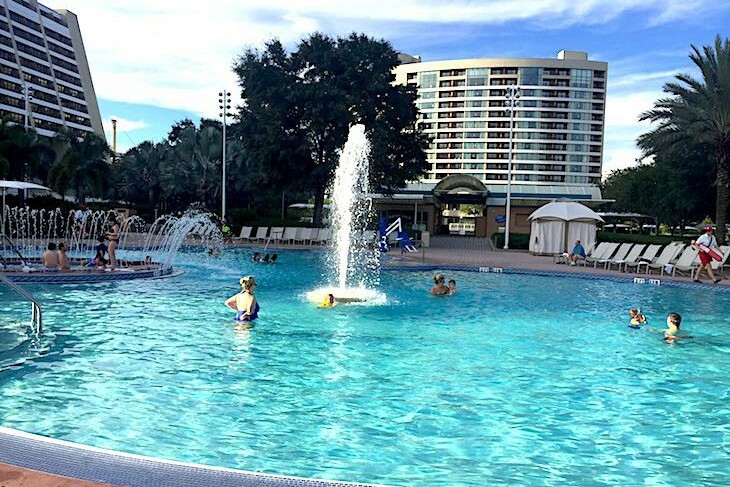 The pool's view of Bay Lake almost makes up for it's lack of theming. Head here for a quieter experience and great views. Dark, rich wood furnishings and beds covered in white duvets, black and white bed runners in a graphic design, soft triple sheets, comfy mattresses, and loads of pillows make these some of the nicer rooms in Disney’s repertoire if only it weren’t for the dated, low ceilings. 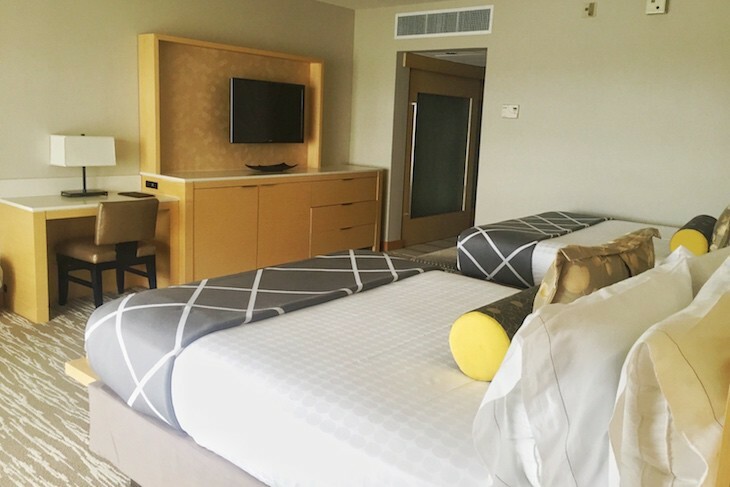 Guest rooms offer attractive touches including a cream-toned, fabric-covered headboard stretching to the ceiling, a flip-over single sofa bed in an unexciting beige, a sleek frosted-glass-topped desk, and contemporary pendant lighting. Carpeting and wall color are a lovely shade of taupe, and the 32-inch LCD flat-panel TV, set in a shallow wall unit, is a bonus. Baths are elegant with chocolate brown and cream marble floors, but, while chic, vanities with elongated, contemporary sinks are quite impractical; you find yourself setting your toiletries in the wet sink instead of on the tiny stainless steel and frosted glass countertop. A bath/shower adjoins the two sinks with the commode in a separate area. The foyer’s two closets are designed with frosted glass panels, trimmed in rich wood, with a granite vanity that hides a refrigerator and coffeemaker. 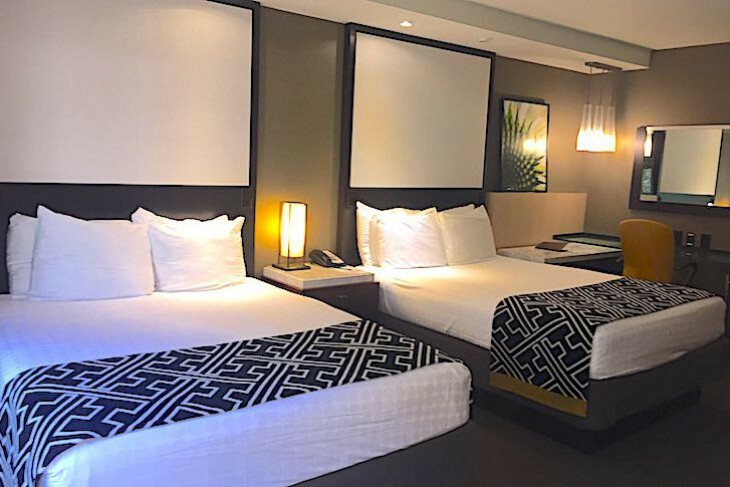 Amenities include a laptop-size electronic safe, fluffy towels, non-lighted makeup mirror, hairdryer, iron and ironing board, IPOD clock radio, and morning newspaper. 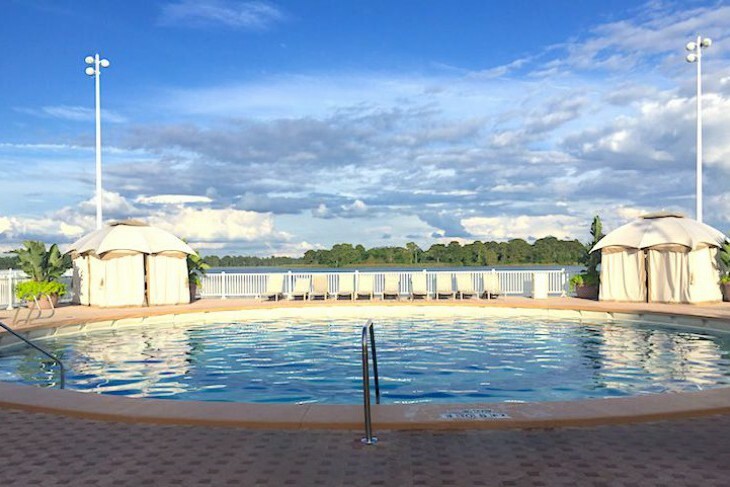 Tower rooms, all with balconies, are the ticket here and worth the additional cost with knockout views of either the Magic Kingdom® Park and glorious sunsets on one side (for a higher price), or beautiful Bay Lake on the other. The higher the floor, the quieter the room and the better the view. 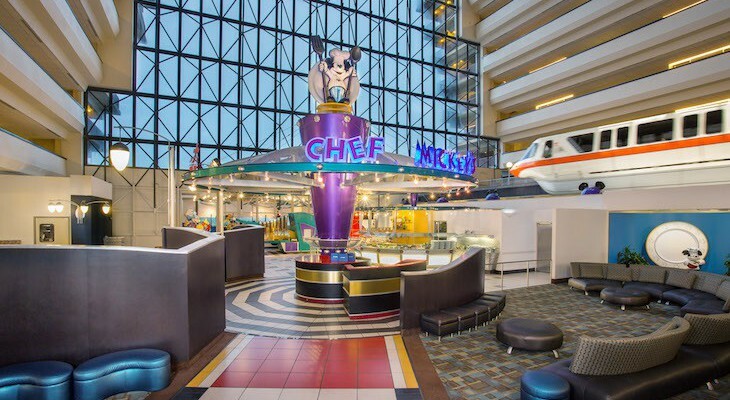 Rooms tend to be noisy due to their suspended position over the Grand Canyon Concourse where the clamor of Chef Mickey’s character breakfast begins in the wee hours of the morning. Request a room on the opposite side of the tower from the restaurant if you prefer to sleep in. The three-story Garden Wing guest rooms offer the same decor and basic configuration as Tower rooms, but they come with a bit of a walk to the main building and the monorail. Bottom-floor rooms have a patio but the top two floors lack balconies. Spend a bit more for a Garden View with vistas of the gardens, the marina, the pools, or Bay Lake instead of a parking lot. Garden Wing Deluxe Rooms sit in the corner of the building making them angular in shape with both the king bed and the living area all in one large space. The living area holds modern furnishings including a sleeper sofa, chair with ottoman, coffee table, entertainment center, and desk. The bath is slightly oversize with two areas: two sinks and tub in one area; shower and toilet apart. A wet bar is in the foyer. Cara's Tip: Although Tower rooms on the Magic Kingdom side have a marvelous view of the park, they also come with a not-so-marvelous view of the parking lot. Still, it’s worth it for front-row seats of the nighttime fireworks display. Disney’s Contemporary Resort has two concierge levels: one on the twelfth floor and another on the fourteenth floor. The Atrium Club on the resort’s twelfth floor is one of Disney’s standout concierge lounges where you’ll find continental breakfast, afternoon snacks, evening appetizers and wine, and after-dinner desserts and cordials as well as private check-in/checkout, turndown service, DVD players, and the services of a concierge staff. 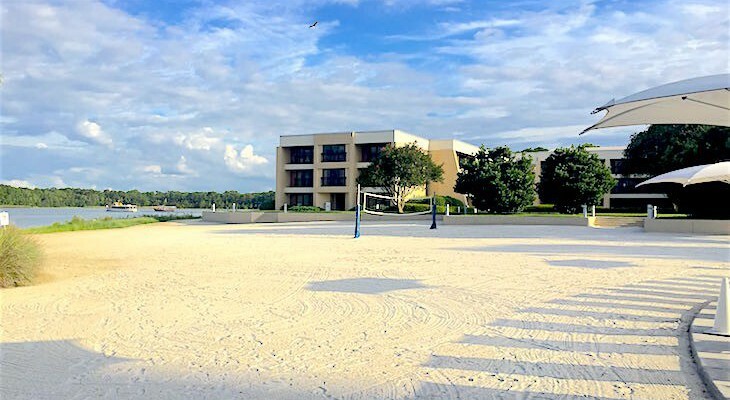 The best part is its lengthy balcony and unbeatable views of the Magic Kingdom and Seven Seas Lagoon including the fireworks show accompanied by music, perfect for those with only a Bay Lake View guest room. 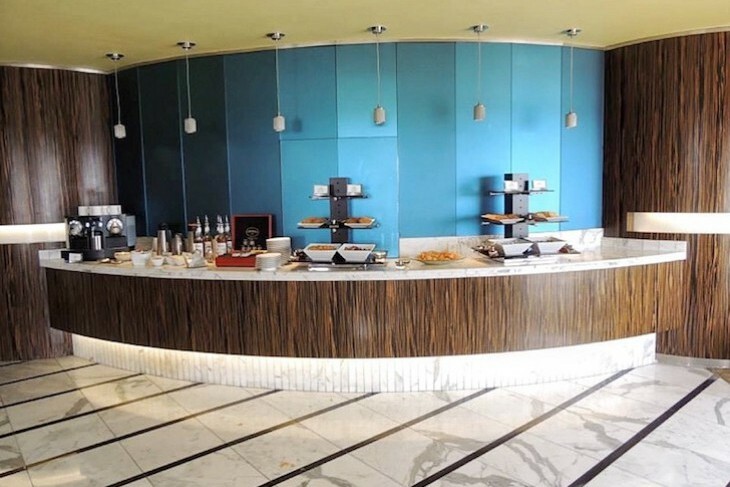 At breakfast are the usual suspects of fruit, juice, pastries, cereal, toast, croissants, mini-muffins, oatmeal, aand bagels; afternoon snacks are gummy bears, cookies, house-made potato chips, goldfish, yogurt-covered pretzels, nuts, fruit, coffee, iced tea, and sodas. In the evening two hot items are offered such as macadamia nut chicken, prosciutto flatbread, conch fritters with spicy remoulade, mini blue crab cheesecakes with chipotle mayo, crunchy chicken lollipops, prosciutto wrapped scallops, beef flatbreads with caramelized onions and goat cheese, duck confit with apple slaw, spring rolls, and pot stickers with soy glaze along with cold items such as American artisanal cheeses, smoked tomato jam bruschetta with fresh mozzarella, vegetable crudités with ranch dip, sun-dried tomato pesto, and PB&J sandwiches. Canyon Road Merlot, BV Century Cellars Chardonnay, and Beringer White Zinfandel are the wines of choice along with a nice variety of beer. After dinner dessert consists of mini-tarts, cannoli, chocolate-covered strawberries, and petit fours with cordials. Fourteenth-floor rooms, suites are done in a light modern and organic look. 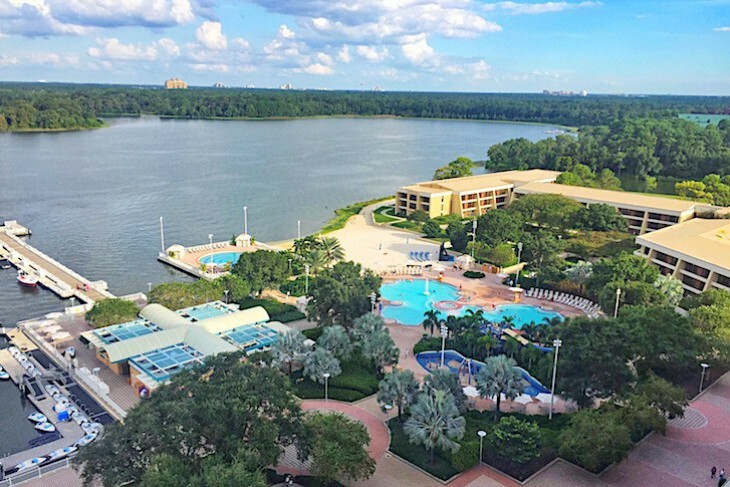 Most accommodations on the 14th floor are suites, but regular-size guest rooms (called Standard Club Rooms) on this floor are larger than the rest and have deep balconies, larger baths, and spectacular views of either the Magic Kingdom or Bay Lake (view is on request only). 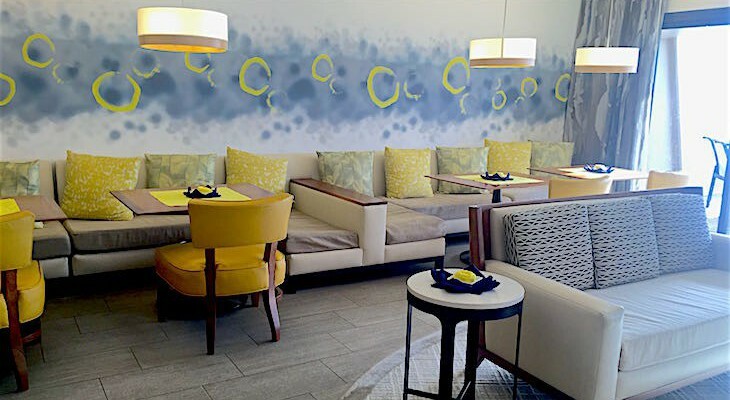 All have the exclusive use of the Tower Club concierge lounge offering the same amenities as the Atrium Club but in a more intimate setting. And because it is the only guest room floor not suspended over the Grand Concourse you won’t be awakened in the early morning hours by the sound of Chef Mickey’s, although those on the Magic Kingdom side might hear noise in the evening from the California Grill above them. The lofty suites on Disney's Contemporary Resort's 14th floor come with spectacular views and minimalistic luxury. One-bedroom Suites have 1,428 square feet and come with either a Bay Lake or a Magic Kingdom view. Enter through a foyer with a metal wall hanging into the living room filled with creamy white furnishings including a sofa, coffee table, desk, and two occasional chairs with, strangely enough, tree stump side tables. Mounted on the wall is a flat-screen TV, and outside is a nice, deep balcony. 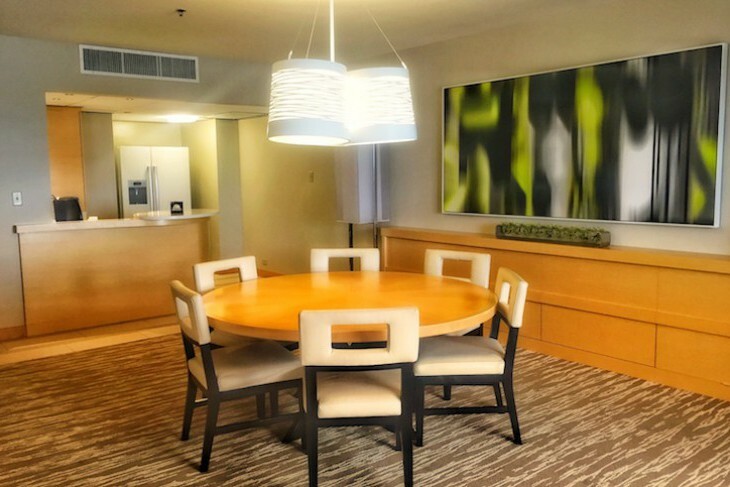 A sofa table and contemporary floor lighting visually divides the living area and dining room where you’ll find a round, six-person table and buffet over which hangs a large piece of modern art in gray and green hues. The dove gray and white-hued contemporary carpeting is a standout. A small, open kitchen offers a full-size refrigerator, microwave, and sink, and a full bath with single sink and shower sits off the entry hall. The suite’s bedroom is similar to a standard-type guest room with two queens or one king bed covered in white duvets adorned with gray and white graphic bed runners and bolsters and fronted by an upholstered bench. Blond wood furnishings include a small nightstand and bureau/desk combination with a wall-mounted flat-screen TV. Its bath, slightly larger than a standard bath with tub and sink set in a white vanity in one room and a commode and sink in another area, has gray and white tile flooring. A king-bedded guest room can be added to make this a two-bedroom suite with 1,892 square feet. 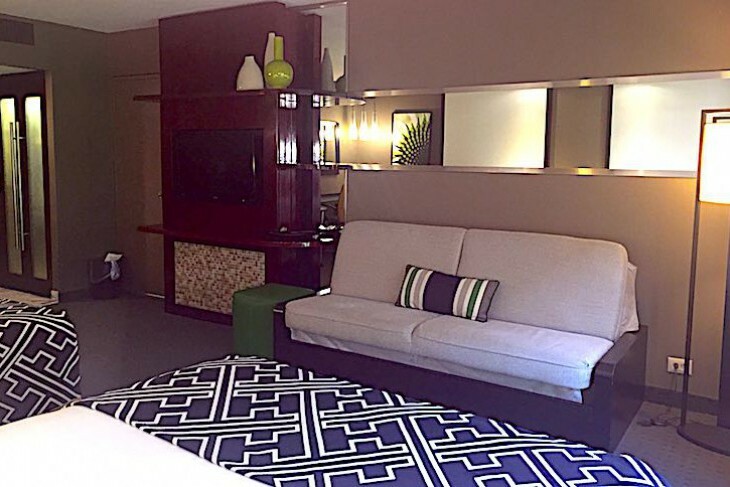 The resort’s Presidential Suite has two bedrooms, three baths in 2,061 square feet. Five deep and spacious balconies span its length and afford spectacular Magic Kingdom views. 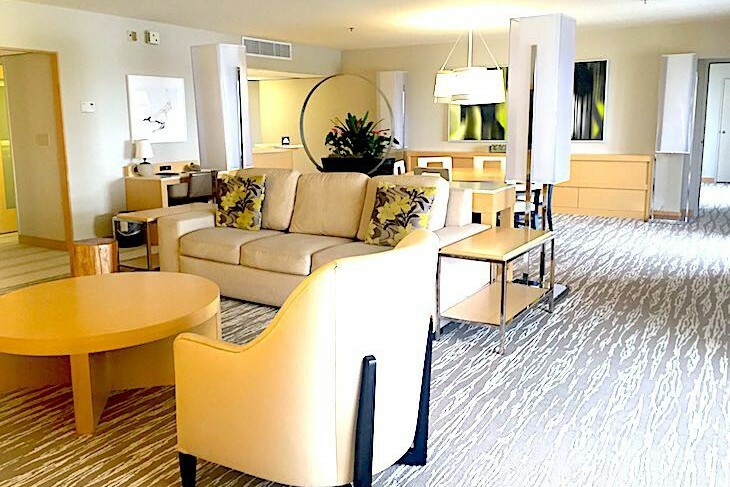 A spacious living room decorated in the same color scheme as the One-Bedroom suite comes with a wet bar and microwave, sofa bed, easy chairs, large flat-screen TV, and six-person dining table. Off the dining area is a two-person bar that opens into the suite’s kitchen with full-size refrigerator, wet bar sink, and microwave. Guests love the huge king-bedded master bedroom with its large sitting area, TV, easy chairs with ottomans, and full-size working desk, as well as a mammoth whirlpool bathtub, separate marble shower, double sinks, two closets, and vanity desk inside the walk-in closet. The second bedroom comes with two queen-size beds and single-sink bath. An additional full bath is off the marble entry hall. The Vice Presidential Suite has two bedrooms, three baths in 1,985 square feet and again the same color scheme as the 1-bedroom. Off the foyer is a single-sink full bath with shower, and in the living area (believe it or not it’s smaller than the living area in a one-bedroom suite) is a six-person dining table, wet bar and microwave, easy chairs, sleeper sofa, oversized flat-screen TV, and deep balconies spanning the length of the suite with views of Bay Lake and, in the far distance, Epcot’s Spaceship Earth. There are two queen-size beds and working desk in the sizable master bedroom. The master bath’s tub lacks a whirlpool, but its two-part bath has one side with a shower, bidet, commode, and vanity desk; the other side is basically a standard size bath. A king bed, two-person table, and single sink bath are in the second bedroom.